The Foundation has been established since 2011 and, since then, has supported young people in their study of music. Students of guitar, piano, recorder, drums and, most recently, harp have benefited from the ongoing success of the Music Festival over the last 20 years. Some of the primary schools now have drums and glockenspiels for all pupils to try. 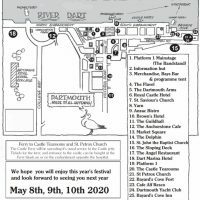 It is extremely important that the Dartmouth community, and the surrounding area, are given the opportunity to be part of that success and the Music Festival is determined to support the musical ambition of its young. These young people are the future of the town and we must look to them to keep the Festival going and to encourage successive generations. Music is under threat nationally within schools and by helping children discover their music potential, we hope to keep the ethos of ‘Music for All’ at the heart of Dart Music Festival. 2017 was a splendid year of workshops, bursaries and instrument purchasing and we would like to share this good news with the people of the town. Dartmouth Pre-school benefitted from a portable keyboard, a wooden xylophone and a rhythm chest. The children from the school sent a ‘thank-you’ photograph and we believe you can’t start too early with the music. Francesca Heard is a budding and talented harpist and singer. Hollie James, plans to take up the piano. Ethan Barton, a singer/songwriter/guitarist who will be appearing at Festival in May 2018. Stoke Fleming Primary School have received funding to go towards drum repairs. St. John’s Baptist Church Primary School to fund 20 weeks of musical instruction.